Americana, Art, Literature, Fine Bindings; general stock. Quality books for readers and collectors. General stock of out-of-print and used books; paper ephemera; postcards. 35,000 volumes from new to antiquarian, maps, prints, periodicals and more! Fine and rare books in many fields! Antiquarian/Rare; Fine Bindings; Illustrated Books. 16th-19th Century Maps & Atlases; Cartographic Reference. Specializing in books and ephemera of the Arts & Crafts Movement in the US & UK. Specialist in rare books of all types especially theology, military and history. Serving book lovers, collectors and libraries since 1991. General antiquarian. An eclectic selection of used and antiquarian books and related items. Printing and Typography, Cookbooks and Cookery. General used. General Out-of-Print books; scholarly books in all fields. A broad range of general stock featuring Poetry, History, Philosophy & Religion. Round Table Books, LLC, lists rare, beautiful and interesting books. Only rare titles for the connoisseur. 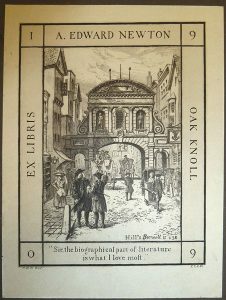 Booksellers since 1986 New, used, rare & unusual books in all categories. Est. 1986. New, used, rare and unusual in all categories. Member ABA, IOBA, BBB. Please visit our website to explore our rare book inventory. Select new & used. Collectible Modern First Editions in Fiction and Poetry. We will be reprinting back issues of the Printed & Bound newsletter on a weekly basis over the next few months. Printed & Bound focuses on the book as a collectible item and as an example of the printer’s art. It provides information about the history of printing and book production, guidelines for developing a book collection, and news about book-related publications and activities. (pjarvis@nandc.com) before reprinting articles. Unless otherwise noted, all content is written by Paula Jarvis, Editor and Publisher. Kim Merker, the man responsible for some of America’s most beautiful books, died on April 28, 2013, at the age of 81. The cause of death was cancer, but his career as a hand-press printer had ended in 1999 when he suffered a stroke. 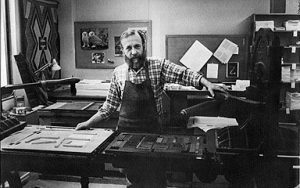 As founder of Windhover Press at the University of Iowa, Merker did triple duty as designer, typesetter, and printer. In addition, he taught printing crafts, bringing his own experience, expertise, and impeccable taste out of the print shop and into the classroom. Merker told his students that producing a book in the traditional way involved a million different choices, including composition and thickness of paper, typeface, ink color, page size, lines per page, margin size, and countless other small but important details. It was Merker’s attention to such details that made him a leader in the world a fine press publishing. In 1957, Merker founded Stone Wall Press. 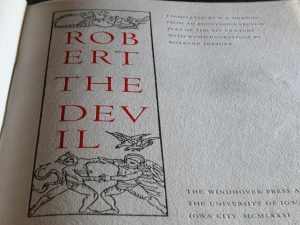 Ten years later, he established Windhover Press at the University of Iowa. It became the university’s official press and a working laboratory for teaching fine book production. 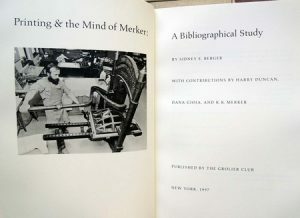 In 1986, Merker created the university’s Center for the Book, an interdisciplinary program for the study of design, papermaking, typography, book preservation, and the history of books. Perhaps the most famous American book collector of the first half of the 20th century, Alfred Edward Newton (1863 or 1864-1940) holds a special place in the annals of American bibliomania. A Philadelphia businessman who became a book collector, author, and publisher, he is perhaps best known to current collectors as the author of Amenities of Book Collecting and Kindred Affections. Published in 1918, Amenities was his first book, and it was an immediate hit among bibliophiles, with more than 25,000 copies being sold during his lifetime. It was followed by numerous other works, including A Magnificent Farce and Other Diversions of a Book Collector (1921), Dr. Johnson: A Play (1923), The Greatest Book in the World (1925), This Book Collecting Game (1928), The Format of the English Novel (1928), A Tourist in Spite of Himself (1930), On Books and Business (1930), End Papers (1933), Derby Day and Other Adventures (1934), Bibliography and PseudoBibliography (1936), and Newton on Blackstone (1937), as well as many articles in the Atlantic Monthly and the Saturday Evening Post. At the time of Newton’s death in 1940, his library, whose contents were assembled with the assistance of such top dealers asGeorge D. Smith and A. S. W. Rosenbach, contained approximately 10,000 books and manuscripts, most of which were English and American literary works. Two highlights among its many treasures were autographed manuscripts of Thomas Hardy’s novel Far from the Madding Crowd and Charles Lamb’s essay Dream Children. 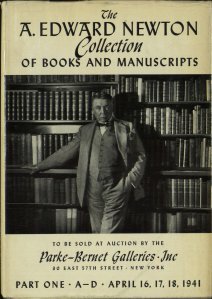 Parke-Bernet Galleries in New York auctioned most of Newton’s collection in April, May, and October of 1941. Because rare book prices had fallen throughout the Great Depression and had not yet recovered, many lots sold for far less than they would have fetched during the late 1920s, when the sale of Jerome Kern’s book collection brought $1,729,462. (Although Kern died in 1945, he disposed of his book collection in January of 1929.) The three-volume catalogue of the famous Newton auction still serves as a reference for collectors of American and English literature. Born in Philadelphia in either 1863 or 1864 (depending on source), Newton was the son of Louise Swift Newton and Alfred Wharton Newton. He married Babette Edelheim in 1890, and they had two children, Caroline Newton and Edward Swift Newton. As president of a successful business in Philadelphia, the Cutter Electric Equipment Manufacturing Company, Newton was able to support his family, make frequent trips to London, and pursue his book-collecting passion. A book collector since childhood, Newton nurtured his ever-growing obsession with first editions, manuscripts, and book-related ephemera and eventually developed a renowned library at his home, “Oak Knoll,” outside Philadelphia in Daylesford, Pennsylvania. (Newton’s home, which has since been demolished, should not be confused with Oak Knoll Books and Oak Knoll Press in New Castle, Delaware.) In addition to collecting books from the 16th and 19th centuries, Newton helped foster an interest in English neoclassical writers (especially Samuel Johnson and James Boswell) during a period when their works were largely unappreciated. The main period of Newton’s book collecting and his writings on the subject coincided with America’s great boom in book collecting, which peaked between 1910 and 1930. The magnitude of his book purchases, the quantity and popularity of his books and magazine articles, and his “colorful public persona” (as at least one writer characterized his checkered suits and bow ties) guaranteed that he would play a central role in this boom. George Eliot —I had almost said than these novelists combined —but I wish to be modest in my statements. Morley’s Three Hours for Lunch Club). Clearly, Newton was no bookish recluse but was, instead, a convivial participant in his community. the best essays and annotated bibliographies of their book collections (Each book collection must include at least 25 items and must have a thematic focus.) The winners are also invited to give a talk about their collections in Swarthmore’s McCabe Library. Since its founding, similar competitions have been established in more than three dozen colleges throughout the country. disgrace.” It was this joy that fueled Newton’s passion for books, a passion he hoped to share with generations to come.